Using art to heal is a powerful tool as it bypasses our conscious and works directly with our subconscious. These processes are not about creating something 'good', but about creating something authentic, which can lead to healing on a deep and profound level. 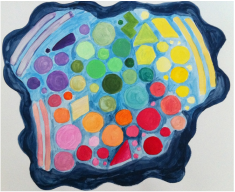 Arts therapy uses creative processes, such as painting, drawing and colouring, to improve and enhance physical, mental and emotional well-being. It is suitable for all ages and many life situations, and can be done with individuals or groups. Art therapy works by accessing imagination and creativity, while by-passing conscious thought processes, which helps to contribute towards the development of a more integrated sense of self, with increased self awareness and acceptance. These hands-on workshops explore creativity and its power to heal & transform. Using different techniques and mediums, participants are guided in a process to create from within, going beyond the need to create something ‘good’, to creating something authentic. Creating from this place allows a deep level of healing to begin. Making art is a fundamental extension of our need to create, and because of this, art making has the potential to increase our internal sense of health and well-being. These workshops are grounded in principles of art therapy and use non-concrete image making. No art experience necessary, although a desire to delve into colour and form and possibly getting a bit messy is a definite advantage! Please check the News & Links page for workshops in my area. If you're interested in hosting a workshop where you are, please contact me to discuss possibilities and details. Come heal with me! These sessions allow a client to go more deeply into personal healing. These one-on-one sessions take the client through a process which creatively allows the client to witness their situation from a different perspective. Sessions are available in person, on-line or by phone. Please contact me for more information or to book a session or workshop. Also, check the News & Views page for dates and times of courses and workshops currently being offered.